Home » Lifestyle » Sport » Rzeszow ready for the Tour de Pologne! Rzeszow ready for the Tour de Pologne! 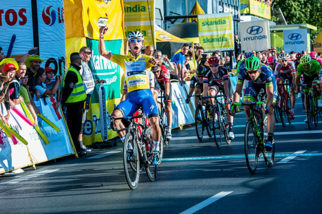 After three years of absence, the biggest cycling event in Poland – Tour de Pologne UCI World Tour will again be organized in Rzeszow. On 16 July in the capital of the Podkarpacie Province, an official press conference relating to the third stage of a jubilee edition of the race took place. The conference was attended by the Mayor of Rzeszow Tadeusz Ferenc, Vice President of Rzeszow – Stanisław Sienko, deputy of the Provincial Police Commander in Podkarpackie Province: Inspector Andrzej Sabik and Chief Executive Officer of 70th Tour de Pologne – Czesław Lang. “I remember that four years ago Mr. Czesław Lang promised me that the jubilee Tour de Pologne will be going through Rzeszow. I’m glad that you have kept your word. Cycling in Poland is becoming more and more popular. We finally have the successors of Szurkowski, Piasecki and Lang. I’m convinced that the ride of cyclist through several loops around the streets of Rzeszów will provide the residents a lot of fun” – says Tadeusz Ferenc, the Mayor of Rzeszow. 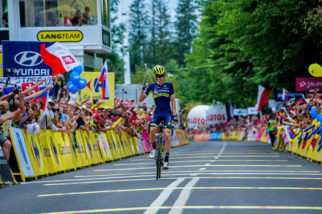 The best cyclist in the world will come to the capital of Podkarpacie Province on 30 July, after riding two historical stages in Trentino in Italy. The stage from Cracow to Rzeszow will have 226 kilometres (about 140 miles). In the city will be the finish of the third stage of 70th Tour de Pologne, the cyclists will have to ride 60 kilometres (about 37 miles) three times. 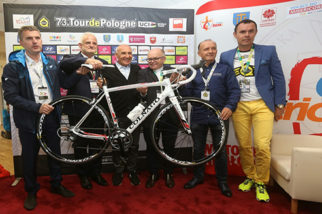 “Rzeszow is perfectly prepared to receive the best cyclists in the world. Here during some cycling events you can always feel the atmosphere of the great sports festival. I’m sure that the same situation will be during 70th Tour the Pologne UCI World Tour. The residents of the capital of Podkarpacie Province are eager to ride a bike, this increases the interest of cyclist generaly greater” – says Czesław Lang, Chief Executive Officer. “I’m impressed by the dynamic changes, which have occurred here. I remember Rzeszow when I was one of the competitors; I have a lot of memories here. This city is very close to me” – adds Czesław Lang. In Rzeszow, the cyclists will finish the first Polish stage of this year’s race. Along the way they will go through, among others, Strzyżów and Lubenia Commune, where the Flat stage finish will be located. In Lubenia, the cyclists will also compete for Tauron Medium mountain stage finish in Third Category. In the capital of Podkarpacie Province the competition of the youngest fans of cycling will start NUTELLA Mini Tour de Pologne.